The selections are intended for third- and fourth-year college curricula, and include Lucan's analysis of the causes of the civil war, depictions of his protagonists Caesar and Pompey at key moments—Caesar's crossing of the Rubicon, the assassination of Pompey as he arrives in Egypt seeking refuge, Cato's funeral oration for Pompey, Caesar's visit to the site of Troy—as well as highly atmospheric passages: Pompey's vision of his dead wife, Julia; and the necromancy performed by the witch Erichtho for Pompey's son. Notes to the passages illuminate Lucan's attitude towards his material—his reluctance to tackle the topic of civil war, his complicated relationship with Virgil's Aeneid, and his passionate involvement in the events through the rhetorical device of apostrophe, when he seems to enter the poem as a character himself. 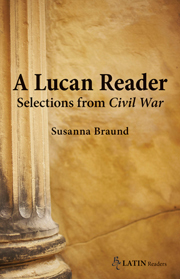 Bryn Mawr Classical Review 2009.06.21 -------------------------------------------------------------------------------- Susanna Braund, A Lucan Reader: Selections from Civil War. BC Latin Readers. Mundelein, Ill.: Bolchazy-Carducci Publishers, 2009. Pp. xxxiv, 134. ISBN 9780865166615. $19.00 (pb). -------------------------------------------------------------------------------- Reviewed by Jennifer E. Thomas, Grinnell College (thomasje@grinnell.edu) Word count: 1051 words Although I have written a little review for a little book, I hope the brevity of my remarks will not detract from the importance of the work discussed. A Lucan Reader is the inaugural publication of the BC Latin Readers, a new series from Bolchazy-Carducci. If the rest of the series live up to the high standards of this volume, the series will be a welcome addition to the college and even high school Latin classroom. I shall first say a few words on the series and then speak on the specific volume in question. BC Latin Readers aim to provide teachers of intermediate and advanced Latin courses with small, affordable texts that expand the repertoire normally taught at this level. Forthcoming Readers will be devoted to authors, genres, and topics, e.g. Apuleius, Latin Epic, and Roman Women. Like A Lucan Reader, each volume will contain around 600 lines of Latin together with introductory notes, commentary, and vocabulary, making it an all-in-one textbook (and one that, in this reviewer's experience, fits easily into a jacket pocket or small purse). The size of these volumes (both physical and in terms of line numbers) has been kept to a minimum to allow for easy mix-and-matching with other texts. The present Lucan volume could be incorporated into any number of courses and would pair excellently with Virgil, Ovid, Tacitus, Caesar, Livy, or Seneca, just to name the authors who first came to my mind. More information on the series in general and its forthcoming volumes may be found at the BC Classical Readers website. Susanna Braund (hereafter B.) has started this new series off in fine style with a text that makes Lucan accessible to Latin students at the intermediate level, no easy accomplishment given the difficulty of Lucan's poem. Her introduction situates both Lucan and the Civil War in their respective historical contexts; she includes both an overview of the war between Caesar and Pompey, with parenthetical references to Lucan's poem, and a summary of the poem in greater detail. B. also introduces the major thematic issues and briar patches of the Bellum Civile: the issue of the poem's completion, Lucan's politics, the role of the gods, Stoic influence, the 'hero' of the poem, Lucan's authorial interventions, and the style and language of the epic. Considering the lack of consensus on so many of these issues amongst Lucan scholars, I found her approach very balanced. The themes of "horror" and "delay" (à la Henderson) are pronounced above others, but, for the most part, her interpretations are traditional or judgment is reserved. On the subject of politics, B. asserts that "to [her] mind, there is no reason to posit any growing discontent with either Nero or the Principate" (xii). As a politicizing reader of Lucan, I found her evidence for this assertion a bit of a straw man, but, as she says, "Lucan's ideological stance remains the most contentious issue in the interpretation of his poem" (xii). Since no interpretation on this line pleases everyone, I am satisfied that the issue was at least brought up and presented to students in some form. On the question of the poem's completion, however, B. does not present at all the theory that the poem is complete as we have it, a view held by many scholars these days after being so articulately argued in Masters' Poetry and Civil War in Lucan's Bellum Civile (1992). Instead B. states that the poem "breaks off" in Book 10 and asks, "Was it unfinished at the time of Lucan's death ... or was part of the text lost at a very early stage?" (xxii) After presenting some alternatives, she suggests that an ending in 12 books at Cato's suicide "has the advantage of literary coherence." She repeats this view throughout the commentary, e.g. on Cato's expanded role in Book 9: "we can assume that Lucan planned a major role for him in the remainder of the poem" (95). This hypothesis certainly has many supporters, but is far from universal. That many scholars believe the poem to be complete should have been brought up and presented to students; at the very least, it should not have been presented as undisputed fact that the poem is unfinished. The text of the reader consists of 15 passages: 1.1-45, 67-157, 183-227, 486-504; 3.8-35, 399-445; 6.624-53; 7.617-37, 647-82, 728-46, 760-811; 8.542-636, 663-88; 9.190-217, 961-99. They total 620 lines. The average, then, is 41 lines, but this figure is rather misleading as the book consists mostly of shorter passage (around 25 lines) with one or two very long passages (90 lines). The passages chosen support B. 's foregrounding of "horror" and "delay," as they highlight the poem's supernatural incidents and authorial interventions. For example, in between the justifiably larger selections from Books 1 and 7 occur just three passages: Julia's ghost, Caesar in the Celtic grove, and a brief snippet of Erichtho, which are certainly the best for showing Lucan's interest in "horror" at the expense of historical accuracy, since all three passages are Lucanian inventions. I am not sure that students reading B. 's selections will have a really complete picture of the BC, but I'm also not sure this would be possible with any 620 line selection, and, after all, de gustibus non disputandum. Based on the length of the passages and grammatical detail in the commentary, I feel this book is ideal for intermediate students, although more advanced students will also find it valuable. The notes are admirably thorough in information grammatical, historical, and cultural. I particularly appreciate B. 's tendency in difficult passages to offer in the notes a reordering of the Latin rather than a translation for the student. This is a wonderful solution to Lucan's particular difficulties. I am very happy that Bolchazy-Carducci put Lucan in the vanguard of their new series of Readers. This text will make it much easier to teach Lucan to undergraduates; and, despite our 'ideological' disagreements, I think B. will succeed with this volume in "provok[ing] students to study this amazing poem in greater depth" (p. vii). I found this text quite free from typographical errors. I did notice that "epulae" has been left out of the vocabulary--students searching for its meaning in the commentary (ad 7.792) will likely come away with the idea that it means "breakfast"!